As used by Prince William himself, here's the basic training manual for fatherhood recruits!Attention! In your hand is an indispensable training manual for new recruits to fatherhood. 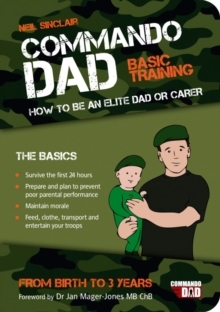 Written by ex-Commando and dad of three, Neil Sinclair, this manual will teach you, in no-nonsense terms, how to: * Survive the first 24 hours * Prepare and Plan to Prevent Poor Parental Performance * Maintain morale in the ranks * Feed, clothe, transport and entertain your troops * Transport the troops successfully on manoeuvres * Increase your flash to bang' time and `square away' tasks along the way. And much, much more. Let Training Commence.